Solution. The term is everywhere! It just may be the most overused and least understood term in technology, SaaS, software, consulting, or business today. So what exactly is a solution? Complete: The solution includes whatever is needed to solve the problem. Integrated: The components are designed to work together. Offering: Whatever is being provided to the customer – could be a software-centric solution, a series of services, a consumer service or good etc. Solves a customer problem: The solution fixes a problem or challenge that the customer has. Now that we’ve defined the term “solution,” let’s take a look at the key components of a good solution. You might think of a solution as following a framework. The Solution Marketing Strategies Solution Framework™ or model describes the following components required to solve a problem. Components can come from the vendor and their partners – and even from the customer. Each of these elements applies to all types of solutions – B2B, B2C, B2E (employee) etc. Customer and pain points – While not solution components per se, the customer and their pain points are the reason that the solution exists. I.e., we’re trying to solve a problem; this is the “why” for the solution. Users: Solutions are purposely designed to meet the needs of users – everyone who comes in contact with, is a beneficiary or stakeholder of the solution. Users are the “who” for the solution. Process: Solutions are usually built to manage some sort of a repeatable, structured process or informal collaboration process. This applies as much to B2B processes like accounts payable processing as it does to B2C processes like hailing a cab from Uber. Process defines “how” the solution works. Data and Content: Solutions run on both structured data (such as database records, pricing, analytics) and unstructured content (such as electronic documents, images, sound files, videos, text). Data and content are “what” flows through the solution. Technology: Solutions often include technology such as equipment, hardware, software (whether cloud or premise-based), and media (such as CDs or DVDs) that enable the solution to manage the process, data and content for the benefit of the customer, users and stakeholders. Technology “enables” the solution. Services: Services fill in the gaps between components and tie the entire solution together into a smoothly operating whole. Services “complete” the solution and can include everything from strategic, integration and deployment services to ongoing support services. Now that you know what a solution is, you may be asking why it matters at all. The above definition and framework help you to see what it takes to really solve a problem. For example, providing software alone may not be enough to solve a customer problem – and the definition and framework above can help you to see that more clearly. This definition can also help you to see broader opportunities for your company – new ways to serve the needs of customers, for example, by adding new services to your technology product. And finally, consistent definitions enable alignment with other functions, partners and customers so you can deliver better outcomes and grow revenue. So what do you think? 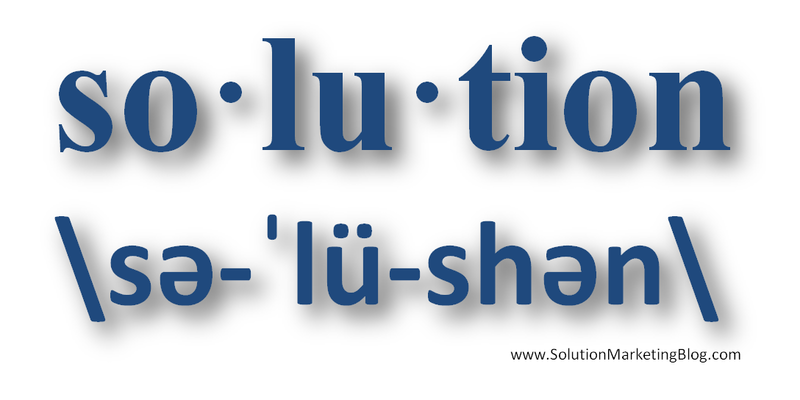 How would you define the term “solution” and what should it include? T hanks to everyone who attended Thursday’s presentation at the Boston Product Management Association, Beyond Products: Solution Marketing. You helped to make it one of the best discussions I’ve ever led on solution marketing. You can find the Beyond Products: Solution Marketing presentation slides as well as the Solution Marketing Framework, along with other solution marketing content on Slideshare. Follow my Twitter stream for the latest solution marketing news. 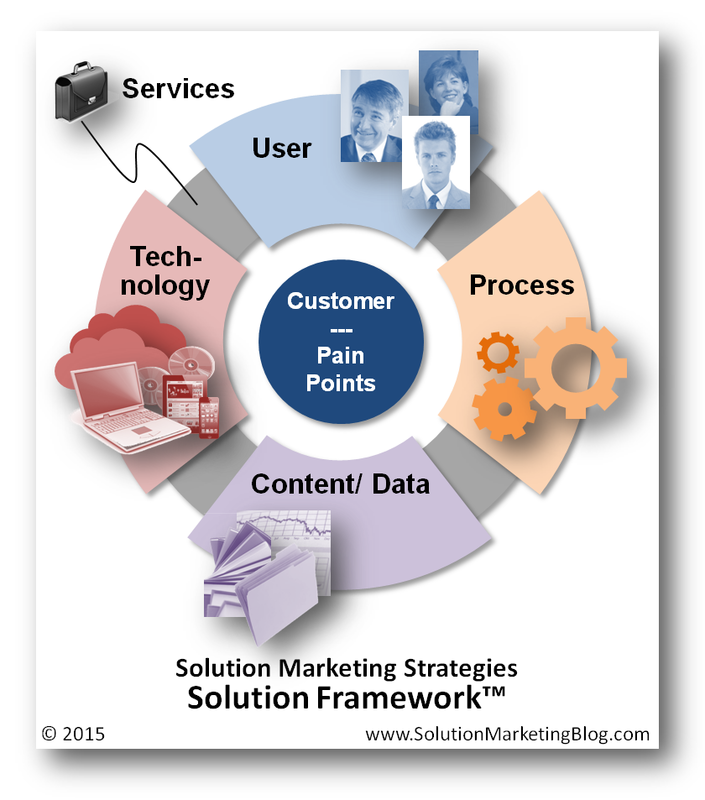 Check out additional articles on The Solution Marketing Blog – and be sure to comment! Special thanks to the great folks at BPMA for organizing this event.